Helps promote hormonal balance, promotes bone and heart health. 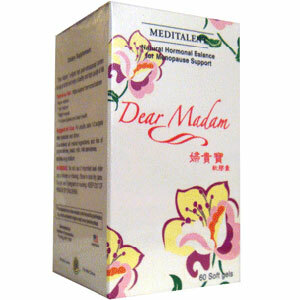 For menopausal symptoms including hot flashes, night sweats. Vitamin E (as d-alpha Tocopheryl acid succinate) 30 I.U. Other ingredients: Soybean oil, beeswax, lecithin, gelatin, glycerin, sorbitol, purified water, FD&C yellow #5, FD&C red #40 and FD&C blue #1. Helps promote hormonal balance, promotes bone and heart health. Menopausal symptoms including hot flashes, night sweats, insomnia, sore waist and backache, osteoporosis, fatigue, lack of energy, incontinence, decrease in sexual desire, stress, poor memory, dizziness, palpitations. For adults, take 1 to 2 softgels 2 times a day; after breakfast and dinner. Do not use if pregnant or nursing. Keep out of reach of children. Breast cancer survivors should not take this product.